Much as we may like to see flowers they are not there to impress us, they are designed to attract pollinators, mostly insects, to the plant and enable the plant to sexually reproduce. The plant provides a reward to the pollinator in the form of nectar or edible pollen and the plant benefits by being able to spread it’s genes. There are between 250,000 and 400,000 plant species in the world and hundreds of novel solutions to getting pollen to their stigma. A huge number, like the conifers did before them, rely on the wind to simply blow their pollen into another receptive plant, e.g. grasses, hence hay fever. Being so scattergun requires you to produce loads of extra pollen. If you get something like a bee to carry your pollen to another flower for you you save a lot or resources as you don’t need to produce as much pollen, but you instead need to invest resources in a flower to attract pollinators to you and then offer them a reward for visiting. Eyes are biological sensors like radio sets tuned to certain frequencies on the electromagnetic spectrum. Radios pick up EM frequencies between about 150 kHz and 25mHz or EM waves from around a metre long to ones a hundred or more metres long. 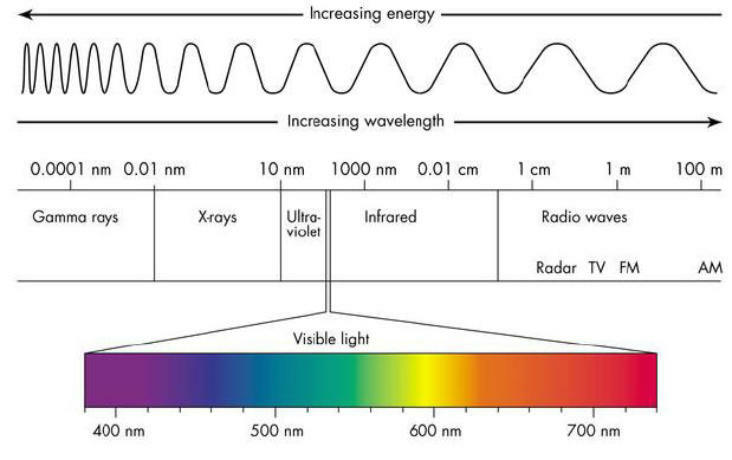 Visible light runs from violet at 790THz (790,000,000,000,000 Hz) / 380nm (0.000000380 m) to red at 400THz / 740nm. Our brain assigns a meaning, i.e. colour, to photons in the visible spectrum striking our the back of our eye. All materials are transparent and opaque to different frequencies on the EM spectrum, flesh is transparent to x-rays, bone is not, which is useful for doctors. Plant leaves look green to us because they largely absorb blue and red light frequencies (to drive photosynthesis) striking them from the sun and reflect the green bit in between. Different animals are sensitive to different wavelengths of light, most insects are able to see well beyond the frequencies of visible light (to humans) into the Ultra Violet. It is light at these higher frequencies that attract insects most, as such the colours in the visible spectrum are not hard indicators of likely pollinators but they can still help indicate pollinator types. So as not to exclude potential pollinators most plants take a generalist approach to attracting pollinators, not specialising too much in morphology so as to allow as many different potential pollinators access to their flowers. Bees respond to generally showy flowers, are especially keen on flowers rich in nectar, though sometimes frequenting those offering a reward of pollen instead of nectar. Yellow and blue flowers are particularly popular; many have markings guiding the bee like runway lights to the reward, often this is visible only in Ultra Violet wavelengths of light. Bees are absolutely vital to our survival in their role as pollinators for many of our food crops. Internationally bees, both wild types like our familiar bumble bees and commercially bred honey bees are in drastic decline. There seems to be several factors combining to cause this decline including disease, parasitism, climate change and insecticide use. By offering as many plants attractive to bees as possible in your garden you can do your little bit to help your local bee population. 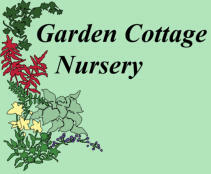 Good bee plants include: Aquilegia, Brunnera, Caltha, Doronicum, Eryngium, Fuchsia, Geranium, Hemerocallis, Iberis, Jasione, Knautia, Lamium, Monarda, Nepeta, Olearia, Primula, Quercus (oaks, like chestnuts, which makes odd tasting honey, provide pollen rather than nectar), Rudbeckia (Rhododendron provide tons of nectar for bees but many varieties make the bees ‘drunk’), Salvia, Thymus, Ulex, Verbascum, Weigela, Xanthorrhoea, Ypsilandra and Zinnia. An X,Y and Z wasn’t easy to come up with! Though moths are not major pollinators in the North of Scotland, elsewhere they can play an important role. Hawk moths particularly have quite a lot of flowers evolved to suit them. Generally flowers for moths are large open, creamy or white, often sweetly or musky scented in the evening. 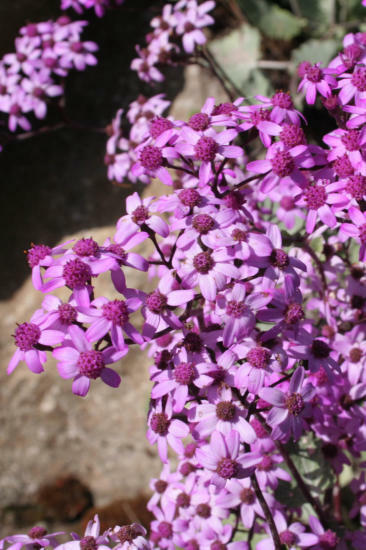 They are usually pollinated on the wing and are nectar-rich to support the hawk moths active life-style. Checkout the fascinating symbiosis between certain species of Yucca and the Yucca moth. 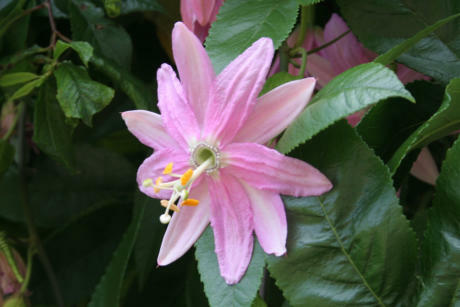 Passiflora mollissima (left) the ‘Banana Passionfruit’ frequented by heavy weight bumble & honey bees in warmer climates. hercaceous perennial Lobelia like Lobelia x speciosa 'Fan Lachs' (right) are great sources of nectar for bees. Butterflies prefer pink and lavender coloured flowers, often strongly scented with long narrow tubes to allow the butterflies to get their long tongues down to the ample nectar. 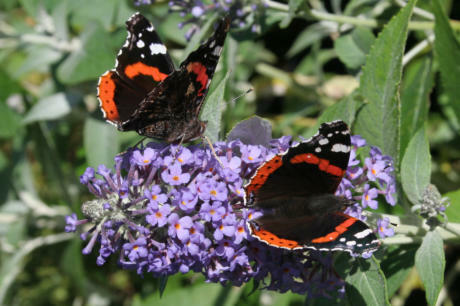 A few good butterfly plants are: Buddleja, Calendula, Echinops, Eupatorium, Echinacea, Hebe, Kniphofia, Lavandula, Mentha, Sedum and Verbena. There are huge numbers of flies in multitudinous varieties, there are many generalist species that take advantage of any available food source and this makes them very frequent pollinators of flowers particularly of non-specialised flowers. 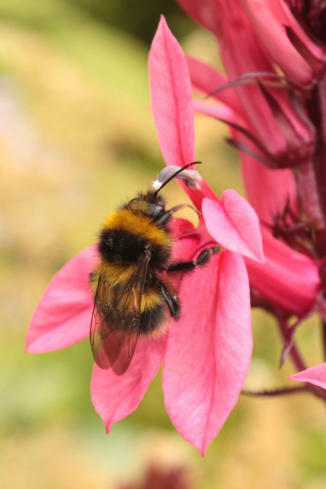 Their ubiquity makes them important pollinators in more extreme environments like alpine regions where there aren’t the range of different specialised pollinators. Many plants also use trickery to attract to attract pollinators and particularly flies. 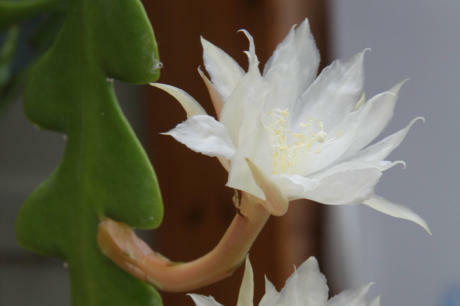 Some flowers will produce chemicals that mimic fly pheromones to attract male flies which will then crawl all over the flower covering themselves in pollen, the plant hopes the fly will then go to another flower of the same species, falling for the same trick again and shed some of its pollen on the stigmas of the second flower. 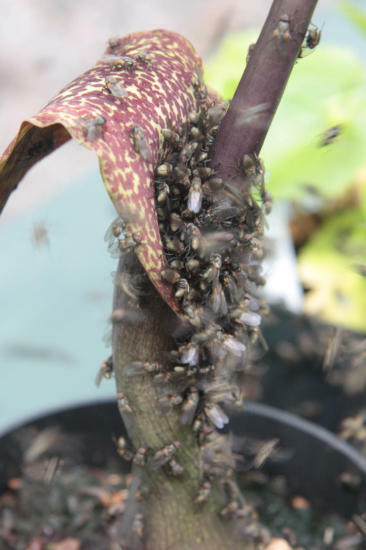 Another common method of duping flies used by plants is to make a flower appear to the fly to be a rotting animal. These flowers are often red or brown in colour and mottled and put out an irresistible scent of corrupting meat. A great many aroids (family Araceae) are pollinated by flies, e.g. Arum, Arisaema, Dracunculus, Lysichiton and the huge and slightly pornographic Amorphophallus titanium. The worlds largest flower is the Indonesian fly-pollinated parasite Rafflesia arnoldii, it is sometimes charmingly called the ‘corpse plant’. Sauromatum venosum (left) doing a convincing impersonation of a dead animal. Pericallis aurita (right) beautiful daisy flowers armed with a strong scent of dung to help draw in flies. Other types of insects act as pollinators in some plant species. Beetles pollinate many Magnolias, amongst the oldest of flowering plants, as such beetles were amongst the first flower pollinators. European wasps (the normal black and yellow kind people try to swat on sight) adore Angelica gigas and figwort (Scrophularia nodosa). Figs require certain species of small wasps to pollinate their flowers, there was an excellent BBC Natural World documentary ‘The Queen of Trees’ on the symbiotic relationship between the African sycamore fig and its pollinator wasp Ceratosolen arabicus and their impact on the wider environment. The producers have put it up on youtube. There are plants that use ants and other sorts of insects as pollinators, ones that use spiders, rodents, bats, frogs, basically if it moves and you can stick pollen on it there is a plant somewhere that uses it as a pollinator.